JACQUELINE LUQMAN: Hi. I’m Jacqueline Luqman with The Real News Network in Baltimore. It is early in the 2020 presidential campaign cycle, and the Democrats already have a very crowded field, with more candidates seemingly declaring every other week. While most are predictably typically corporate neoliberal mascots for the DNC, there is still excitement about Bernie Sanders’s #NotMeUs campaign that he has revived. And through Sanders’s campaign he’s been able to bring some pretty big issues, like Medicare for All and tuition-free college into the public political discourse. But the one issue he hasn’t been able to really bring to any kind of national consensus or acceptance is the issue of reparations. 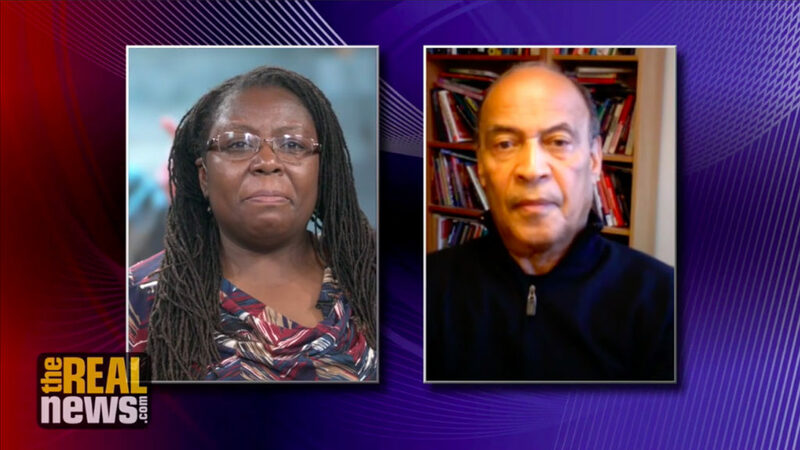 So here to talk about that issue in the context of Sanders’s other platform policies, electoral politics, and American society in general, is Dr. Adolph Reed, political science professor at the University of Pennsylvania specializing in race in American politics. Thank you so much for joining me today, Dr. Reed. ADOLPH REED: Oh, sure, it’s my pleasure. Always for The Real News. JACQUELINE LUQMAN: Thank you so much. All right, so I have to ask you first, because I know that you are a supporter of Sanders. You were a supporter of him in 2016. I have to ask you, are you as excited about his campaign and his potential candidacy this time around as you were last time? ADOLPH REED: Oh, yeah. I’d say I am. I mean, I think there’s a key component of the presidential campaign is the movement building aspect. And I think in particular the campaign is a great opportunity to get out and try to build support for the Medicare for All campaign, which is a crucial piece of the agenda for 2020. JACQUELINE LUQMAN: So I have to ask you, because we think that there is a change in the DNC rules this year that a lot of people think might make it easier for Sanders to gain the nomination. Do you think he will have a as difficult a hill to climb in this primary process? Or do you think he will have–do you think he has more momentum this time around? ADOLPH REED: Well, it’s a good question. I mean, he certainly has momentum. And I have to say, political scientists work best at predicting what’s already happened, not what’s going to happen. Yeah, he’s got momentum, but I think that’s a double-edged sword. Because it seems to me pretty clear that one item that’s at the top of all of the other candidates’s agendas is to keep him from getting the nomination. So I think that’s going to make it tougher. JACQUELINE LUQMAN: So I’m glad you brought that point up, because I do believe that there is some strategizing, some DNC strategizing with all these other candidates talking about this issue of reparations where no one else would before. And I think it’s fair to say that most other candidates are talking about it because of Sanders’s reticence on broaching the issue. ADOLPH REED: That’s probably right. JACQUELINE LUQMAN: So you know, I agree. I think we can agree that that is, with the other candidates talking about reparations, that’s a political ploy. But when we’re talking about Sanders, who was able to bring issues, like you said Medicare for All, which was very unpopular at one time. Now, not only because of him, because he didn’t come up with the idea, but because he was able to bring that idea to his bully pulpit, so to speak, it’s not only become popular, it’s become a mandate among progressives and among people who don’t identify themselves politically who support Sanders. The same thing is true with tuition-free college; not something that was popular. Something that most Americans didn’t even realize existed at one time in this country. Sanders has brought the idea mainstream, and it’s a part of the mandate. Same thing with the Green New Deal. So tell me, Dr. Reed, why is it that a candidate who has this kind of bully pulpit already, he’s not even president, can bring unpopular ideas to the fore and make them not only popular, but make them critical campaign platforms, but he can’t do that with reparations? And should he? ADOLPH REED: Right. Yeah, I want to say a couple of things. First of all, there’s always been a base of support, a bigger base of support in the country for single payer health care than one would think from reading the New York Times or watching MSNBC. But your question–well, I think there a couple of things. One is that, you know, Sanders has been pretty clear that he thinks politically the notion is a nonstarter. And frankly this is the way I’ve always felt about it, too. I mean, the first question for me, like–at the beginning of the century I was out of the country for a month, and I was someplace where I didn’t have tegular access to U.S. news media. And I came back and found that the reparations idea, which I had known from my early 20s, had popped back up into, or popped into popular discussion. I was curious why. And my question always has been about it, I mean, how can you imagine putting together a political alliance that can prevail on this issue? And you know, 17, 18 years, 19 years, I haven’t gotten a clear response to that. So from that perspective I think, OK, well, you know, what’s the point? I mean, it’s a symbolic gesture, not a politics that–not a political objective that has a capacity to alter people’s lives. In the campaign in 2016, people often enough would ask me why Sanders doesn’t address so-called black issues. And my response was always the same, just to go down the platform and point out and ask, really, item by item, whether or not that would be a policy that would disproportionately benefit black people and Latinos. And always answer was yeah, it would be. So Sanders has a black agenda. And that black agenda is–in addition to the civil rights, stuff, obviously–it is is a full employment economy, Medicare for All, free free public higher education. Urban investment, so forth and so on. Because every one of those initiatives would disproportionately benefit black Americans. Working people. Right. So–and you know, I don’t have the senator in my pocket. But from what I’ve read and heard he seems to feel pretty much the same way about the reparations issue that I do, which is that first of all, you can’t imagine putting together a political alliance that would be capable of winning on the issue of however it’s defined. The other thing I’ve noticed–so in that event, I mean, what is the issue? And I saw that he asked at some rally not that long ago, or commented that he doesn’t even know what the notion means. And I can see that also, because there’s a lot of kind of slippage and moving around. In fact, like, my son who is an historian, who has actually written about this issue both in a forthcoming book and not that long ago a Jacobin article, what he’s referring to as the ‘peace with honor’ phase of reparations talk, by which he means as a reference to Vietnam when the U.S. was defeated and was trying to figure a way out by calling defeat victory and leaving. Because what seems to be happening is is that what people are saying about what they mean by reparations is becoming more and more diffuse, so that even reaffirmation of a commitment to Title 7 antidiscrimination and enforcement can be understood as reparations. So from that perspective it is difficult to say what people mean by it. So that’s another problem. I mean–yeah, I’m sorry. Go ahead. JACQUELINE LUQMAN: No, no. And you raised a lot of points, and I think I want to go back to the first point about political viability, because that’s the first argument we hear a lot about reparations. You know, it’ll never win. No one’s going to support it. It’s not a politically viable policy. Even if we knew what it was it’s so unpopular that people won’t support it. Even though there may have been a broad based support in this country for single payer, it has not been as large as it is now. And certainly there hasn’t been a broad based support for tuition-free college, because there was at one time in this country not the crisis of exorbitant tuition, college tuition debt. So that’s a very new thing. So just the idea of free college tuition was–not only was it not popular, people didn’t even think it was a problem. It was an issue that needed to be addressed. Yes, you know, the fossil fuel industry knew about the climate crisis 40, 50 years ago. But most people didn’t know anything about climate change, didn’t think that climate change was an issue. And as a matter of fact, Sanders himself said, you know, “I said that climate change was the most pressing national defense issue that we were facing.” And people laughed at him then, but now they take him seriously. So when we look at the evolution of these impossible policies, none of them which seem politically viable at some point in the history of American politics, how is reparations different from those policies? ADOLPH REED: Well, in one crucial way, actually. And that is that you can see, in a democratic system, you’ve got to you’ve got to be able at least to envision a majoritarian path toward adoption of a policy. You can see the path to building a majority behind Medicare for All, or free public higher ed, or really addressing climate change, or the like. But the only way to get, to imagine building a sustainable electoral majority for pursuit of reparations is to depend on people who wouldn’t get anything from it to support it. And you know, that’s what I think is the big stumbling block. And you know, I wouldn’t even argue that the vast majority of whites in America would be opposed to it in principle. A lot of people would be, certainly. And in that sense it would be a divisive issue. But just because an issue is divisive doesn’t mean it shouldn’t be pursued. But it’s just, frankly, impossible to imagine from the standpoint of pragmatic politics that you could mobilize the kind of coalition to win it that would need to be mobilized to prevail in a majoritarian democratic system. But on the other hand, I’ve noticed that–I just saw a couple of days ago that some guy in Forbes published an article contending that reparations was the only way to advance a discussion of race, or whatever cliched way he put it. Goldman Sachs not that long ago came out and doubled down on its support for diversity, and that sort of thing. And within the Democratic Party, I’m seeing what looks to me like an alliance between the Clintonite corporate Wall Street Democrats what we might call the identitarian left to come together around support or reparations. And considering that the Wall Street wing of the Democratic Party has mobilized consistently against any kind of economic redistribution, that just raises concerns to me about what kind of allies or what kind of alliances are being formed. JACQUELINE LUQMAN: Oh, I think that’s a very valid point, because the issue is the framing, I think, of the discussion. So when you–so I want to go back to what you said about Sanders questioning what reparations is. And I believe this goes directly to the framing of what reparations is. Even if we have people in this country who we know will not support reparations, like when you said that we can imagine a broad based support for how we would gather a broad base support for Medicare for All or free college tuition, or climate change legislation, because people would get something out of those pieces of legislation were they passed to address those issues. But couldn’t it be said that the way, the reason that coalition can be built is because those people now who would be a part of this coalition, those people now are being affected by those issues? I mean, what I’m saying is they didn’t care about those issues until they were personally affected by those issues. So now they want to be a part of a coalition. Is that–I mean, if someone were to look at that framing of saying that we can imagine creating a broad based coalition around these other issues, what do you say to people who would come back and say “Well, of course they want to be a part of this broad based coalition. These problems are harming them, so of course they want solutions”? ADOLPH REED: Well, I say a couple of things. I mean, one is that that’s not necessarily the case. I mean, there were people who were concerned about those issues whether or not they were capable of articulating them publicly, and are people who respond or who are prepared to be responsive to discussion of them without having necessarily thought consciously about them before. But bracketing those two points, yeah. I mean, it’s certainly the case that people are concerned about those issues because they are affecting them. But that’s kind of my point, right, because the reparations issue doesn’t affect them. And I mean–and the frightening thing about all that, the potentially concerning thing about it, is that if we talk about reparations, even while making certain what it means, or no matter what it means, and what one of the problems is is we need to have a clearer understanding of what the term means, like–look, I’m somebody who came who came of age in the black power era, and I recall very clearly one of the problems with the Black Power notion was that it seemed to convey a lot, but didn’t really convey anything. But anyway, put that to one side, too. If we talk to people about getting behind reparations without at the same time talking to people about paths to improve their own lives and to reduce their own insecurity, then I’m concerned that that could wind up backfiring on us and being a base of recruitment for Trump and the rest of the right. JACQUELINE LUQMAN: Well, I think you bring up a great point. Again, I think I want to go back to the messaging and how people receive what people mean when they say reparations, because there is legislation, actually, that has been introduced every year by Rep. John Conyers, H.R. 40, which doesn’t necessarily define what the final reparations will look like, but it does set out to answer those questions not just in the form of the way Sanders and other people immediately characterize reparations, as cutting a check. And we don’t even have time to get into the messaging around that. But it also focuses on legislative possibilities, and how those disparities came to exist within the frame of the United States government. So if–and now I have to go back to Sanders and his bully pulpit, and his ability to help his supporters imagine that other impossible policies are possible–if we could convince Bernie Sanders that fine, you don’t have to say you support any kind of reparations, but at least you support the idea of answering the question and supporting the legislation that exists to do just that, to convene a commission of people to work on this alongside of, as Henry Wallace found out with his 60 million jobs proposal, that you can have broad based economic policies that uplift all people, but you must address racial issues also. And that was unpopular then. The same thing that A. Philip Randolph and Bayard Rustin found out when they introduced the Freedom Budget for all Americans, which they specifically said they didn’t want to be something only for black Americans, but they said they wanted to uplift poor white people also. But then that wasn’t popular, either. Do you think at some point we really just need to bite the political bullet and say, listen, we do need to make this issue a political reality as far as advancing the discourse is concerned, even if we don’t get there, which I think is the reality that exists with Medicare for All and free college tuition and other platform policies that are wonderful, but with the current Congress and the next Congress full of corporate Democrats we’re not going to get to? ADOLPH REED: That’s right. And part of fighting for those objectives at this point now is indeed the change in Congress. But well, look, a couple of things. I mean Wallace’s campaign may have been a little more complex, but the reason that the Freedom Budget for all Americans didn’t get anywhere didn’t have to do with its not addressing race. Like, it had to do with stiff opposition from the Johnson administration. And also like from other elements in the civil rights and labor communities who were tied into the Johnson administration in ways that made them skittish to get behind it actively, but also because the nature of the economy was changing at that point. But nevertheless, all that said, I mean, if–I mean, again, you know, I’m not a proxy for Senator Sanders on this question. I just on my own fail to understand what the term ‘reparations’ does for us. If it’s possible to address those economic inequalities and other socioeconomic inequalities, even those that appear most conspicuously as racial disparities, without the frame of reparations, which I’m convinced that is possible to do, then what does it add? I mean, it’s a symbolic move. So what what’s the point of the symbolism, and what does it do for us politically? Or I mean, not just politically, right. In what domain does it do anything for us? JACQUELINE LUQMAN: And unfortunately, we are out of time, because I would absolutely love to continue this discussion picking it up right at that point. What does reparations do for us? But we cannot finish that part of the discussion today. ADOLPH REED: You can do it again at some other point. JACQUELINE LUQMAN: That’s absolutely wonderful because I really thank you for coming on and having this discussion with me. And we will continue this discussion about reparations, progressive politics, Bernie Sanders, and what it means for Americans and for African Americans in particular. Thank you to Dr. Adolph Reed for joining me today. JACQUELINE LUQMAN: I’m Jacqueline Luqman for The Real News Network. Adolph Reed, Jr. is a professor of political science at the University of Pennsylvania specializing in race and American politics.